Formally Ao Phra Nang (“Princess Bay”) although everybody uses the short form, Ao Nang is the most “Westernized” beach in Krabi, originally a backpacker hotspot but now moving slowly upmarket as the airport brings in higher flyers. While not quite as scenic as Rai Leh, there is a good range of cheap accommodation, many good restaurants, easy transport and travel/tour agencies ready to cater to your every whim, making it a good base for exploring Krabi. Orienting yourself in Ao Nang is easy: almost everything is located either along the beach, which runs west-east, or along the Airport Road (Hwy 4203) which goes up north from the east end of the beach. Long-tail boats arrive on the beach near the junction of the two roads; these long-tails, though, create a problem: the level of noise pollution arising from an endless stream of undampened boat motors during high season is substantial. As long as visitors are ever increasing this problem will continue to worsen and detract from the beauty of this beach. Another problem getting more acute with the rising number of tourists in high season is the raw sewage carried directly into the sea, responsible for occasional bad smells which can be strong depending on the daily currents and the disgusting aesthetics. 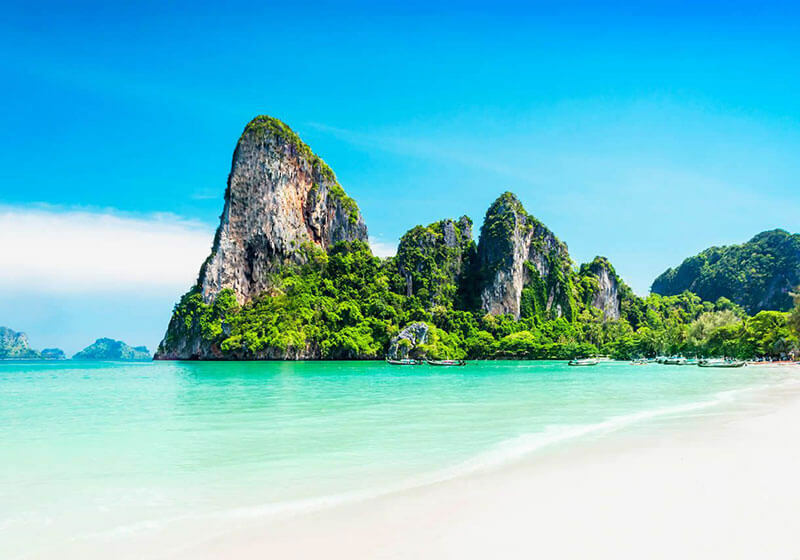 Short Description: Ao Nang is a central point of the coastal province of Krabi, Thailand. The town consists chiefly of a main street, which is dominated by restaurants, pubs, shops and other commerce aimed at tourists. The main beach is used by sunbathers to a certain extent, but there are a large number of longtail boats which offer access to other beaches on the mainland and on nearby islands.